An ‘Open-Mic’ event for all the Shakespeare lovers out there. 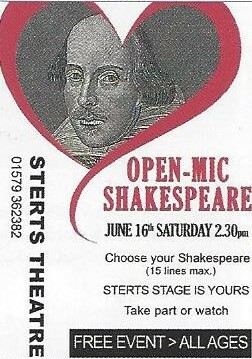 Simply choose your favourite Shakespeare (15 lines max) and come along and perform on Sterts stage, or simply watch and listen. Bring your friends and family, all ages welcome. A free event but donations are welcomed.